My lovely BF loves meat. He can have a meal of just meat, with a side of more meat. The problem is, we live $20 worth of gas away from the supermarket, so I usually buy a LOT of vegetables that will go bad quite fast, and as part of my November zero food waste goal, I need him to eat some veggies without complaining. Enters…. pizza! 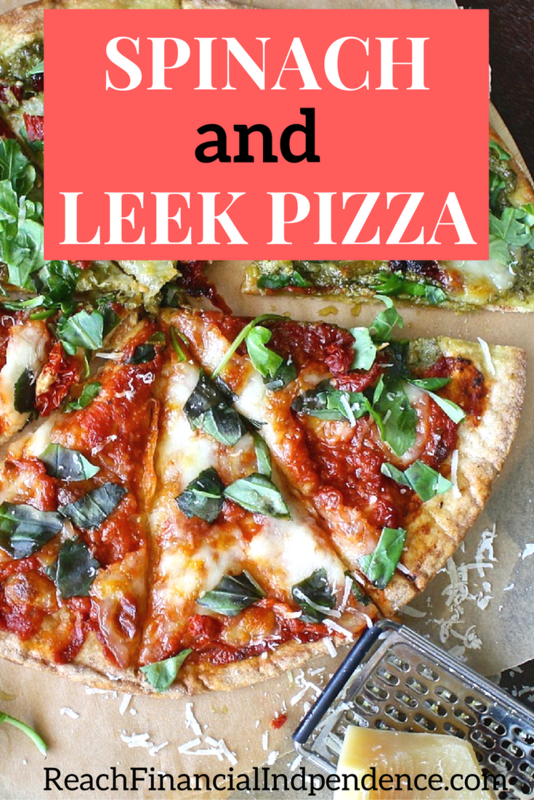 I love making pizza because it is super easy and making the dough from scratch I can control what I put in, so it is much healthier. 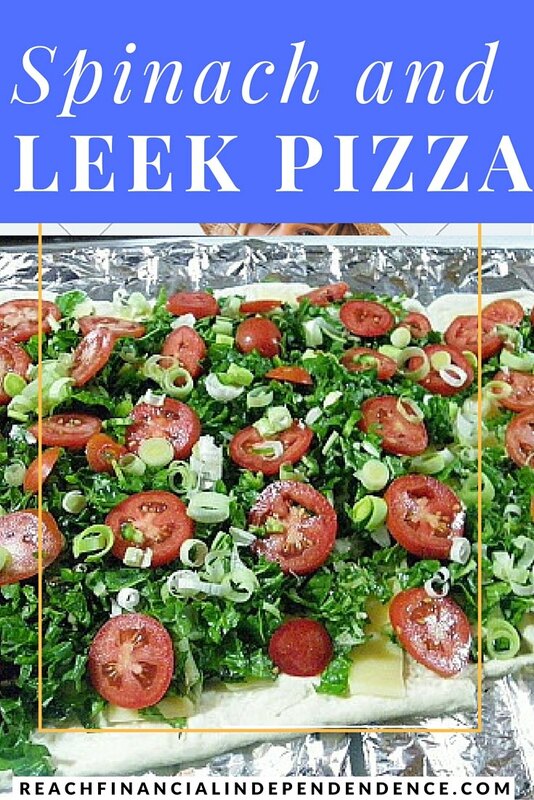 It is a perfect recipe for my friends on a frugal grocery challenge as well as the vegetarians out there, you can skip the cheese if you like. 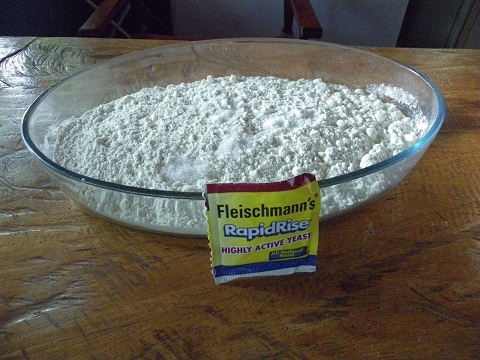 You put the flour in a bowl, I chose a Pyrex because it is easy to clean after. Add to the flour salt to your taste and a little pack of yeast. I try to buy fresh yeast, you can get some from your local bakery, but this time is it a chemical one. Filling half a Pyrex will give me enough dough for two big pizzas, I will then freeze one half of the dough for another lazy day. Add to that flour mix two tablespoons of olive oil and a cup of warm water. Not hot, just warm. Mix everything with your hand, and if the mix is still dry, add a little bit of water. Until you obtain a nice soft dough that doesn’t stick to your hands. If it does, add some flour to balance the dough. 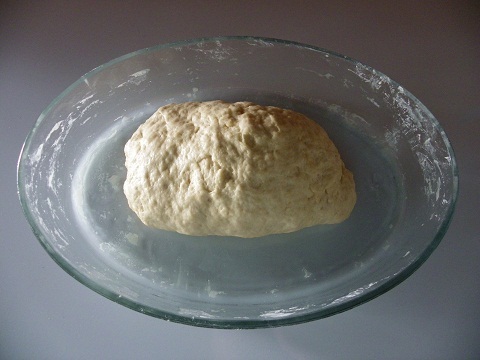 Your bowl should be clean and the dough compactly put together. 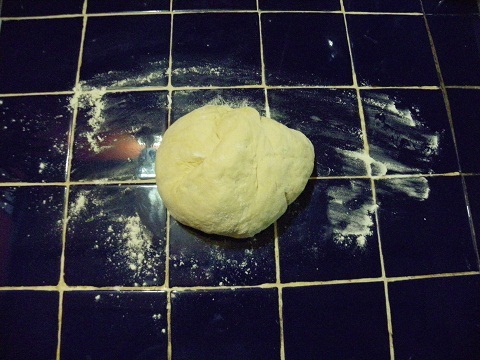 Cover your dough with a cloth and leave it to rise for an hour. It can be a couple of hours in a cold climate, or you can put it next to a source of heat to accelerate the rise. The dough should roughly double in size. Time to prepare the topping. 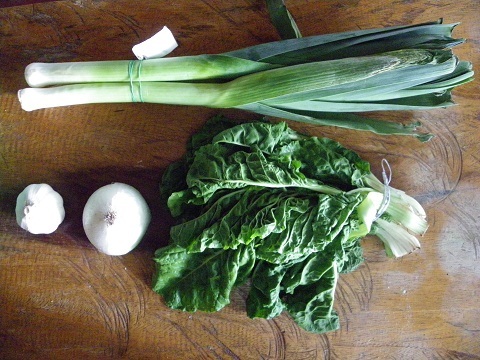 I prepared a few vegetables, some spinach, leek, onion, and a lot of garlic. I chopped the spinach and pressed the garlic together with the onion, and left that mixture in a tupperware with a bit of olive oil. I leave it while the dough rises and it gets all flavored in garlic. 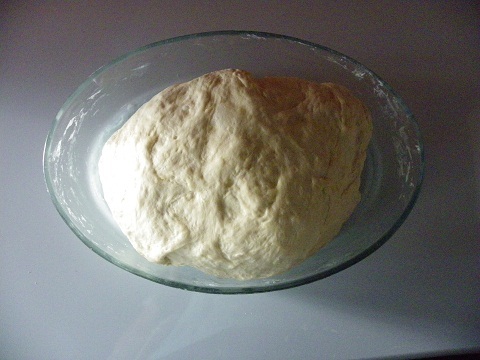 The dough is ready for topping. Put your oven to the highest heat in the meanwhile. 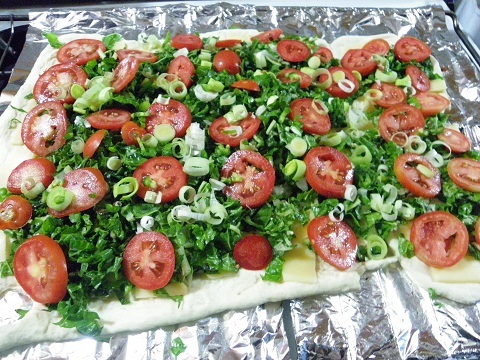 I put a first layer of cheese, then spread my green mix, some sliced tomatoes and sprinkled some leek on top because it gives a nice taste and looks quite fun. I dare you to put leek and fun in the same sentence! When the oven is hot, put the pizza inside until the dough is starting to get brown, your meal is ready! 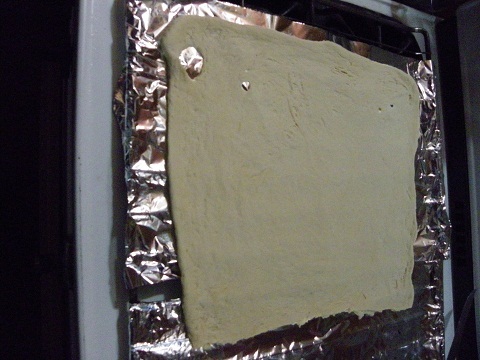 By covering the full oven’s grill, we had enough pizza for two meals, and another two with the frozen dough. Costs are higher than a ready made frozen pizza, because cheese is about $8 a pound here, and I used about $5 of cheese. Grated cheese is even more expensive, I sliced a 1lb piece very thinly until most of the dough’s surface was covered, taking into account the cheese will melt and cover the holes. 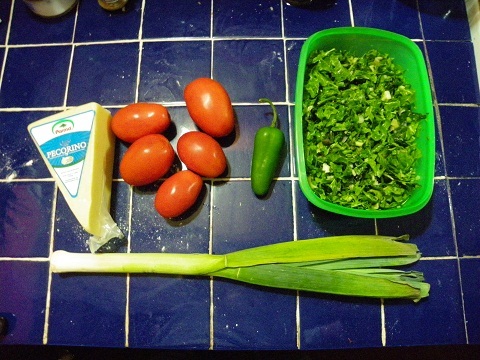 The rest of the ingredients are very cheap, totaling $8, or $2 per person per meal. Bon appétit! Do you have other delicious recipes to make your family eat greens? That looks like one healthy pizza! I unfortunately will be eating an EXTREMELY unhealthy deep dish tonight at one of my favorite pizza places 🙂 I would consider trying this, though, as I love pizza but haven’t gotten into the healthier types. enjoy! I loved 4 cheese pizza before and pepperoni, but find them too loaded with grease now. Healthy options mean you can have twice as much pizza! That sounds awesome! We actually love veggie pizza and we don’t eat a lot of meat anyway. Now I am hungry! 🙂 I love spinach pizza, I used to hate spinach but when I was introduced to spinach pizza I wondered where it had been my entire life. We’re usually pretty big salad eaters, so we tend to do pretty good with our greens. 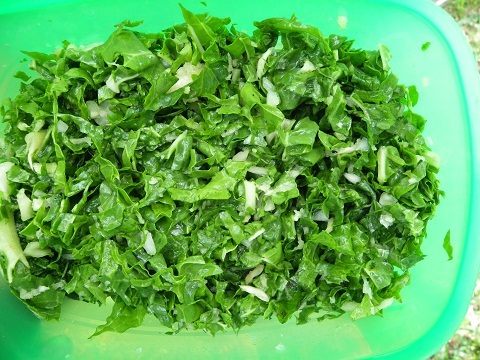 Spinach it also very good raw in a salad. I am not a fan of it when it is just boiled and looks like green mud. Your pizza looks delicious. Amazing how much cheese costs these days. 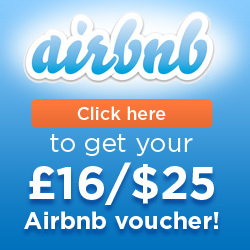 I find it very expensive in our city as well. I have cultures and make yogurt, I need to look into making cheese, some ricotta would be delicious on that pizza.. Yes, Ricotta would be good. And I was thinking Feta, like a Greek salad. Would that bake nicely? I am not sure as feta doesn’t have as much fat I think it would dry up. Will have to try! That was a great layout of how to make a pizza. The photos really helped to show the process. 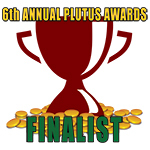 Thank you for voting for my blog last week in the Best Real Estate Investing Blog Contest! No problem! I don’t have kids and was forced veggies down with threats, it didn’t really work… I even managed to hid some or go to the bathroom three times a meal to empty my castor cheeks. Try the spinach pizza! That looks delicious!! Pizza is my favorite! that one is yummy, you should try it! Ooooh… Been thinking about baking my own pizza lately. I can find fresh mozzarella at the market, at reasonable prices. Thinking about doing my own sauce too from scratch. And DC, thanks a lot for reminding me about deep dish pizza… I’ll now have cravings for a week! Off-topic: Saw you changed your theme! How do you like it? I tried Thesis, but went with a StudioPress theme instead. Lots of work re-doing everything, but I like how it’s turning out. There is a pretty good vintage cheese at la bodegona that will melt nicely on pizza. I don’t usually put sauce, just a layer of cheese and tomatoes on top. Sauce is super easy though, in a blender you can mix an onion, tomatoes, some garlic, maybe a jalapeño… it will bake with the pizza. My theme is not Thesis, it is a cheap imitation 🙂 quite nice so far but I have a lot to change still. I’m sitting here hungry right now and drooling! That looks amazing! I have been doing our own dough recently, but use a mix that comes in a bag. I bet it’s cheaper to mix it like you did. My man wouldn’t eat spinach on a pizza unless I hid it under a Pepperoni, but I have to think our home made ones are better than the frozen or take out kind. I love to put different bell peppers on mine. I wish they were more affordable. If I watch closely, one of the grocery stores sells 2 pound bags of cheese for $5 about once a month, always on a Friday. I try to stock up when it’s cheap, so that makes up for the peppers. Man that pizza makes me wish I could eat tomatoes. I have a lot of fruit allergies, so I’m a little limited with some foods. My food secret to eat veggies is to put them in soup. You can put almost any vegetable in soup and won’t be able to tell it’s in there.